Being comfortable in your own skin is one thing. Being comfortable in your clothes is essential. 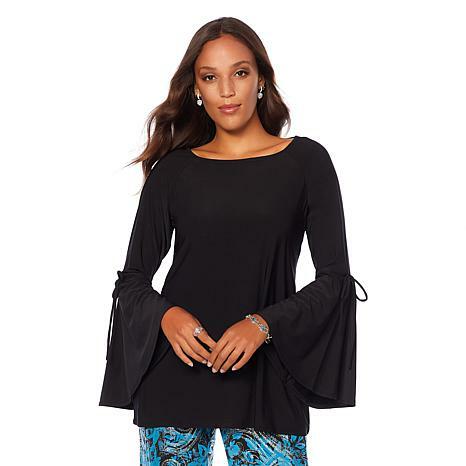 This stretch jersey knit top has flirty bell sleeves, a chic squared neckline and figure-flattering silhouette. Pair it with a classic skirt or pull-on pants, then add a billowy scarf and some statement jewelry for effortless elegance. Love the fabric. It falls away from the hip. The length is perfect. Love the coral color. I wish it came in a v-neck. It would elongate the body better. Love Anthony very much! Anthony just knows how to dress a woman.Material, style and wash and wear are exceptional.His clothes are an addiction. I just love the huge bell sleeves! Right on trend. The fit is true to my normal size, with a little extra length to cover tummy and thigh areas. The material feels a bit heavier than what Antthony uses but still has wrinkle-free quality. It feels like a high-quality material. I would definitely recommend this one! Fits well. Comfortable and looks great. Ordered another. I have only one word to describe this shirt. Comfortable. An ode to the queen of fashion. Thank you for keeping us always in style with gorgeous garbs that make us smile. For instance, take this chiffon poet-sleeve top and add it to any bottoms in your wardrobe for a pretty pop.